California Governor Jerry Brown has signed a bill prohibiting cities from limiting the installation of drought-tolerant landscaping on residential property, enabling homeowners to install EasyTurf's water-saving artificial grass; EasyTurf CEO declares it "another win for California"
Following last month’s legislation regarding HOAs and artificial turf, California Governor Jerry Brown has signed a bill prohibiting cities, counties, and any part therein from limiting the installation of drought-tolerant landscaping, synthetic grass, or artificial turf on residential property. Additionally, the bill reaffirmed that conservation is an issue of statewide concern. Authored by Assemblyman Mike Gatto (D-Los Angeles), Assembly Bill 1164 was signed into law on Friday, October 9th and took effect immediately. Although weather forecasters have predicted more rain this season thanks to El Nino, it is unlikely that it will be enough precipitation to eradicate the drought. EasyTurf, a FieldTurf® company, provides environmentally friendly residential and commercial lawns, recreational fields, playgrounds, putting greens, and conservation plans for communities throughout North America. 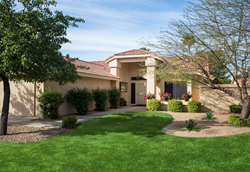 The state-of-the-art turf offers realism, drainage, and durability for both residential and commercial applications. EasyTurf is based in Vista, Calif. (northern San Diego County). More information is available at http://www.easyturf.com or by calling (866) 352-0233.